850 South La Brea Ave. It was bound to happen. Today was an off day at Umami La Brea. The usually impeccably and precisely cooked burger first came out cooked to an aggressive and parched Well Done. Both the burger and the bun were over-cooked. The patty/puck was charred and black on the exterior--I have never had a burger this badly over-cooked before. I brought it back to the counter, after cutting it open to reveal the gray interior, to demonstrate that it was miles past Med-Rare. The smoldering exterior was probably sufficient, but I felt the need to make a point. I filled up on pickles as I watched the other 4 members of my party finish their burgers as mine was being re-fired. 15 minutes later a fresh (raw) burger arrived. 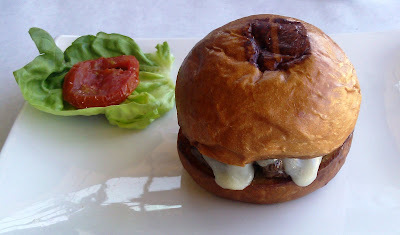 Still, the quality that I have come to expect from Umami Burger was not present. The beef was lackluster. It had zero taste of beefiness. 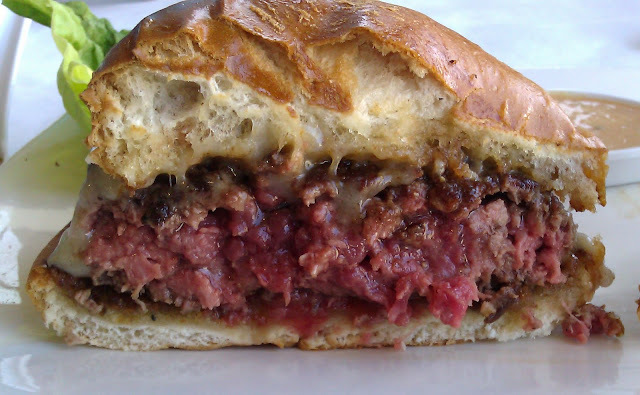 It tasted strongly of the umami ingredients added to the beef, but the beef itself contributed no flavor. Gone was the beefy, aged goodness that had previously served to anchor the dish. This was probably due to the dramatic under-cooking on the second round of preparing the meal. The texture was weak, as well. This was a wad of tartar on a bun. For round 2, the burger was cooked to a lukewarm Rare (dead raw) rather than the Med-Rare, which I had requested....twice. The seasoning on the burger that I tried was uneven and mostly lacking. It took three bites to locate a seasoned portion on the cheeseburger. After five bites, I gave up and asked for a box. The cheese on both tries was the white cheese that came with the Truffle Burger rather than the usual yellow cheese that has always topped the SoCal Burger. Even the sear was lackluster on that second attempt. I had trouble understanding why it took 15 minutes to deliver a raw and poorly seared burger. 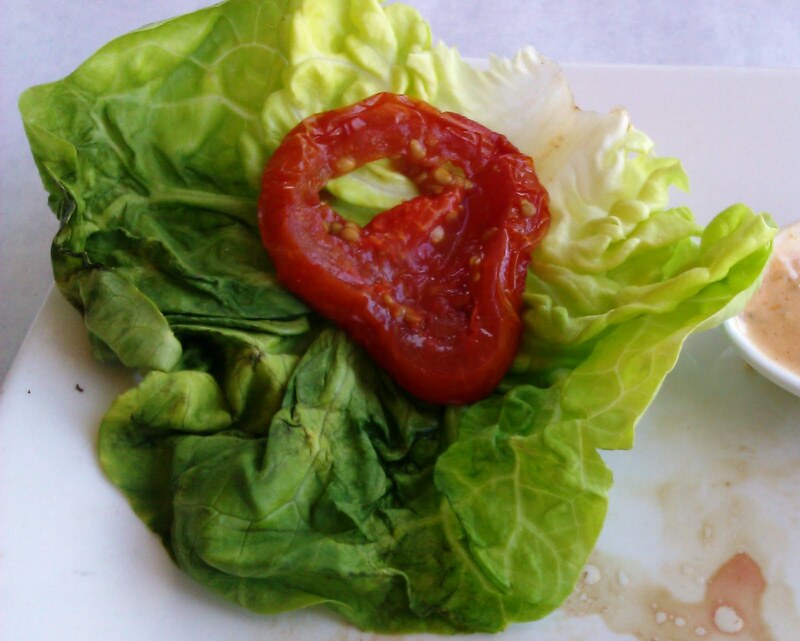 Finally, the butter leaf lettuce that accompanied my SoCal Burger was wilted, rubbery, and brown/black in spots. I found all of this especially surprising since I had sent the first burger back for being incorrectly prepared. This was a serious stumble for the otherwise fantastic burgers that Umami Burger has delivered in the past. I hope that this was only an isolated case of PEBGAP....Problem Exists Between Griddle And Plate, and I happened in on a day when the kitchen staff simply stopped caring. It was around 2:00 PM on a Wednesday--maybe they had a hellish lunch rush. Sadly, the front of house staff didn't notice any of these issues when shuttling the food from the kitchen to the table. The value was hard to gauge The friendly wait staff comped the burger, and I boxed up half of it and called it a day. The other four members of my group had long completed their food, and the server had already cleared most of the plates from the table before my food even arrived. Has anyone else experienced a similar declining trend in quality, or was I simply particularly unlucky today? Burger Review : Umami Burger--What happened? Umami has never been great. They are the most overhyped burger in Los Angeles. Atrocious service, overpriced, and disgustingly greasy.